1. Heat the oil in a large saucepan and fry the shallots, fennel and peppers for 6-8 minutes until beginning to colour, adding the garlic for the last couple of minutes. Crumble the saffron into 1 tbsp boiling water in a small bowl. 2. Add the fish stock and tomatoes to the pan and bring to a gentle simmer. Cover and cook for 15 minutes. 3. 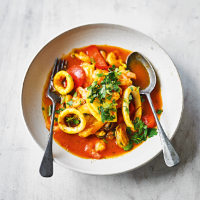 Stir in the saffron liquid, frozen seafood and parsley and cook for a further 5 minutes until bubbling and piping hot. Season and serve. To spice up this dish, serve with a pot of Marine Gourmet Rouille, a spicy, garlicky sauce that’s great spooned into the stew at the table or spread onto toasted baguette.